Supersonic Festival are delighted to be partnering with the British Library Sound Archive to create a new commission as part of the Capsule Labs, an artist development and commissioning scheme devised to create more opportunities for commissioning experimental, cross-disciplinary art. 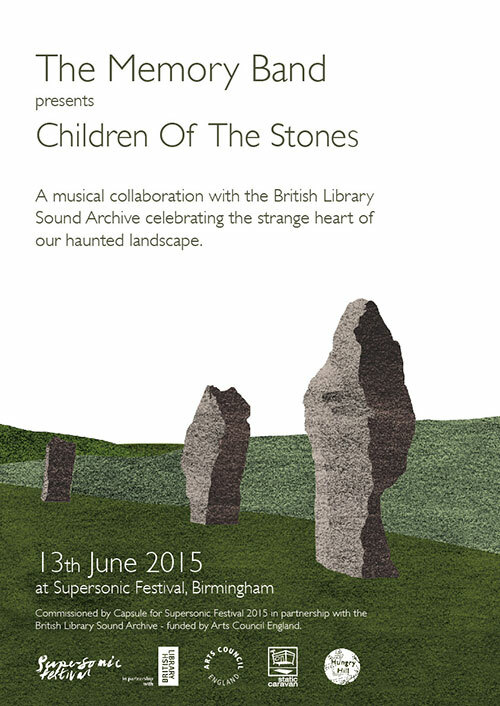 Stephen Cracknell, founder of The Memory Band, has worked with selected material from the Library’s archive to create a new work, Children of the Stones is intended as a sonic adventure into the strange heart of our haunted landscape. . Mixing archival recordings, natural and industrial sounds, traditional melodies and original field recordings alongside a new acoustic score, the performance will celebrate the strange, mysterious and playful relationship we have developed with the ancient and magical landscape we inhabit. Since 2003 The Memory Band has been mapping the mutant edgelands of British Folk music, where digital machinery and acoustic music combine to make traditional music from the future. To accompany the commission there will be a ltd edition seven inch record on sale containing audio from the performance via Static Caravan Records.